You can’t miss them. If they are flying overhead you will hear a loud bugling type call that is very distinct. 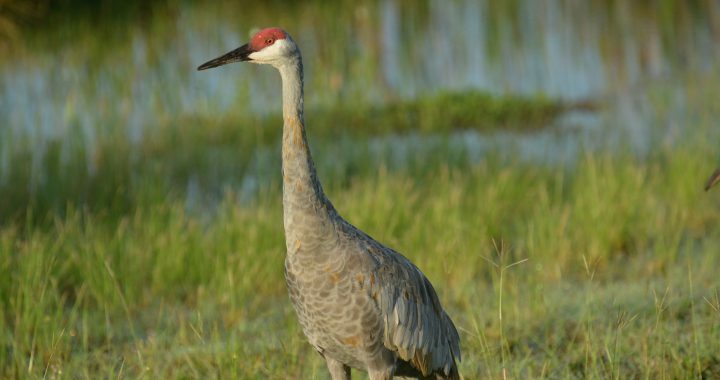 Every year from mid November until mid to late December (even as late as January and February), the Sandhill Cranes can be seen and definitely heard in some parts of North America as they make their stop over in parts of the midwest. Usually after Thanksgiving, Jeff and I make a day trip over to Ewing Bottoms in Indiana where we can see thousands of these birds in large open farm fields. Our goal is to get there about an hour before dusk when you can see flocks upon flocks flying in from just about everywhere to land in the lowland fields for the night. It is such an amazing spectacle to see and yes, hear too. I look forward to it every year. Ewing Bottoms is a low area just north of the East Fork of the White River between Brownstown, Indiana, and the hill country of the Hoosier National Forest. This is all private farm property however, all you have to do is drive along the roads there to be able to see them. Then just stop, roll down your windows and listen to the wonders of nature. Added NOTE: The photo below was taken on February 10, 2018 which is actually later than this post was written. We went to look for Sandhills back in December but there were not many to be seen only about a few hundred. I know that is not too bad but when you have seen thousands gathered in the fields and flying overhead, it is just not the same. It seems as though the cranes have gathered a little later this time. Jeff and I were lucky to see a few thousand cranes around the fields in the bottoms. Pretty awesome! The crane in the photo is doing a dance which is usually done to attract a female but could also be to make territorial claims. The Sandhill Crane is one of 2 types of Cranes found in North America. The Whooping Crane, the largest bird in North America and coming in at 5 feet tall with a wingspan of 7 feet, is the other one. This is a rare bird to see as they are endangered. However, we have seen them in the mix of Sandhills at Ewing Bottoms a couple of times that we have gone. 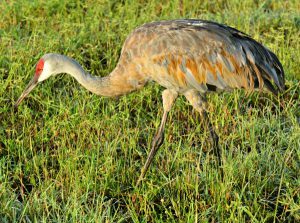 The Sandhill Crane itself is around 4.5 to 5 feet tall and is a pale silver/gray bird with long, black legs. It’s wingspan can be anywhere from 5.5 feet to 7.5 feet. 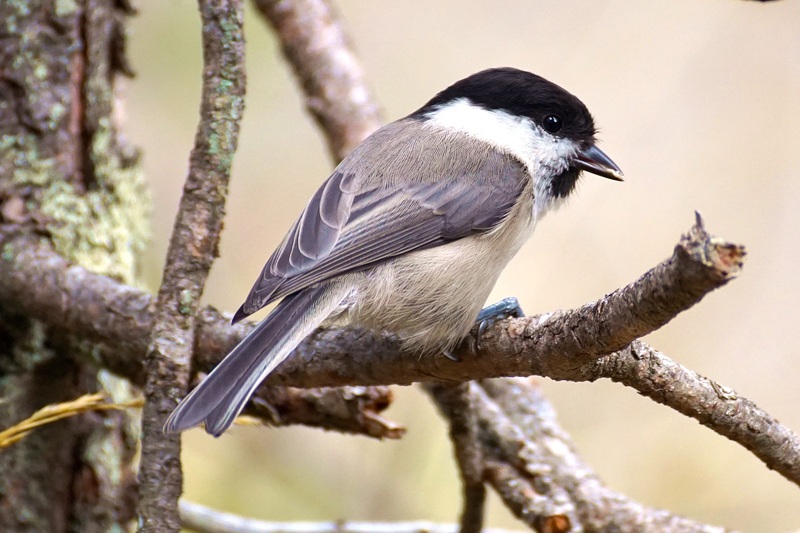 It has a red patch on its crown and has a thin, pointed black bill. Their diet includes insects, roots of aquatic plants, rodents, snails, frogs, lizards, snakes, nestling birds, berries, and seeds. They may eat large quantities of cultivated grains when available. They breed in the northern parts of North America and summer in California, Texas, Mexico, and Florida areas. Some Sandhill Cranes are year round residents in Florida. Located in Medaryville, Indiana this is another great place to see large numbers of flocks. Click on the link above and it will give you counts of Sandhills that have been seen on specific days. Yesterday, November 14th there were 7706 Cranes counted. This is where they have a festival of the cranes every year. This year it is November 14 – 19. Thousands of cranes, snow geese, and other migratory birds rest and feed in the Rio Grande Valley, New Mexico. Located in central Nebraska on the Platte River between Kearney and Grand Island. The migration starts in late February, and peaks in mid-March. There are other places that you can go to see large numbers of Sandhills. The places listed above just happen to be prime locations. If you hear a loud rolling bugle type sound in the sky above you, it is probably Sandhill Cranes flying over. I remember coming out of a department store on an icy cold, November day hearing them a few years back. What a sight to see and hear as they flew over above me. I haven’t been as lucky since then. So every year my husband and I trek over to see amazing numbers of these birds at Ewing Bottoms in Indiana. Sandhill Cranes are everywhere flying in the sky and feeding on the farm fields all the while making their loud bugle calls. You just have to see it for yourself to believe it. How about you? Have you seen Sandhill Cranes where you live? I would love to hear from you. Feel free to comment below. Posted in Birding Hotspots, Ducks, Geese, Shorebirds. ← Winter Birds Are Starting to Arrive! I live east of Columbus IN and had numerous flocks of SHC’s go over yesterday 1/25/19. Seems late for southern migration. I wondered if arctic low in place if it drove birds farther south and later than usual? 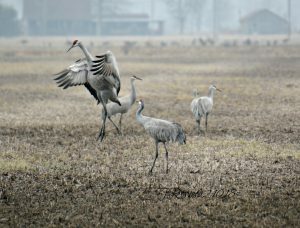 Sandhill Crane migrations usually peaks in late January to mid February. We just saw a few thousand at Ewing Bottoms in Indiana about 2 weeks ago. Weather could definitely be playing a big part on their movement. I hope this helps. Thanks for your comments.